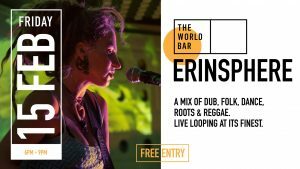 Join us and Erinsphere for those perfect Friday afternoon vibes. She’ll be down in the courtyard making some music magic from 6PM – 9PM. Watch her craft complex tunes from scratch in front of your eyes.. or simply soak up the vibe..
Get down & get involved!